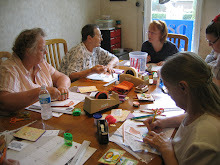 Just wanted to let everyone know that there is no calendar for June for Cootie Coo Creations this month. The shop will be open on just THREE days in June: Friday, June 1 (Katie's basket class at 10:00am and $5 Make N Takes from 5:00pm - 8:00pm); Saturday, June 2 ($5.00 Make N Takes from 10:00am - 1:00pm) and Tuesday, June 12, Mixed Media Artists from 10:00am - noon). The shop will be closed for the rest of the month as Sharon desperately tries to clean, purge and organize the shop and then heads off for a 10-day trip to Ireland. However, those who are interested may take advantage of the FLASH SALE on June 1 and 2, when everything in the shop (with the exception of gift cards and class fees) will be on sale for 25% OFF the regular price - whoop whoop!